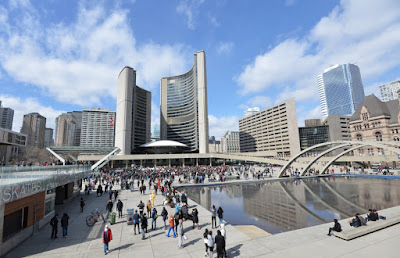 The International Day of Pillow Fighting brings close, fluffy combat to Nathan Phillips Square on Saturday, April 2nd from 3-6 p.m. Brought to the city by the group at Newmindspace, the organization does all sorts of wacky events like the light swords battle and the bubble battle. 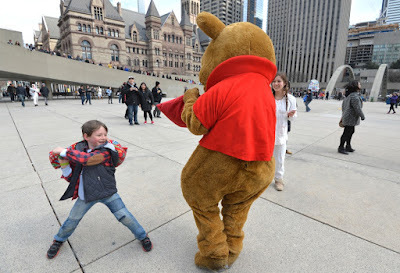 "Pillows fly and teddies soar as you converge for a giant urban pillow fight! Swing and whack as you evade pillow-wielding assailants. Bring a soft pillow and wait for the signal. 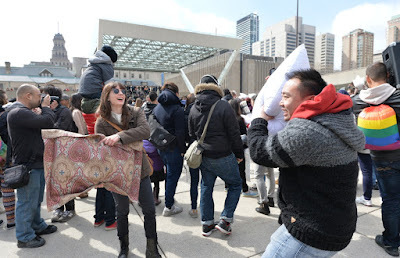 Pillow fight! Rules: Please follow these guidelines to ensure a safe and fun pillow fight for everybody! 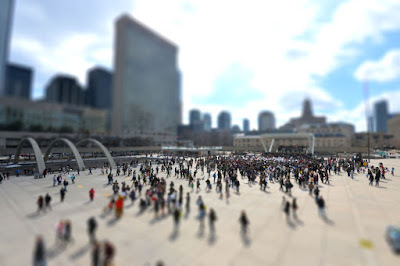 Play fights will happen all over the world during this, the 7th annual International Pillow Fight Day as over 100 cities will erupt in joyous swinging of the pillows. 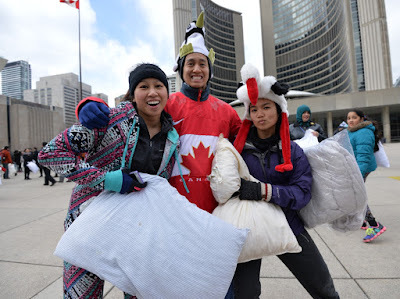 These are photos from the 2015 Pillow Fight.